This year the Serpentine Gallery hosted the seventh of its annual Marathons, the weekend-long events in which eighty to ninety speakers have around twenty minutes to talk on a given topic. On this occasion, the subject was, fittingly for this review, memory; previous ones have included poetry, mapping, manifestos, experiments, gardens and interviews. The events take place at the tail end of the Frieze Art Fair week in October in London and, although programmed and produced by the Serpentine’s curatorial team, they have come to be closely associated with the gallery’s co-director, Hans Ulrich Obrist, and particularly his style of quick-fire production and lateral outsourcing – that is, asking experts for their ideas for other experts. As a result, the Serpentine Marathons have been unrivalled in the art world for bringing in star power during their limited time-frame, particularly from fields outside of the art world. On the downside, because of their marathon format, speakers are only given a short window in which to speak, and no time for Q&As. The madcap dash feel of the event, in which one speaker is whisked off the stage in time for the next to appear, allows for a run of interesting contributions but leaves little room for reflection or even basic digestion. Members of the audience following the 24-hour Serpentine Gallery Interview Marathon 2006 through an outdoor screen installed outside the Serpentine Gallery Pavilion 2006, designed by Rem Koolhaas and Cecil Balmond, with Arup, London, 28–29 July 2006. Photograph: Declan O’Neill. Courtesy Serpentine Gallery, LondonThis has been the main criticism levelled at the Marathons and, while valid, neglects the extent to which the Marathons figure their eventhood as a positive within itself – reaching out for participation among their audience – and as one which outweighs the format’s inherent negatives. One way this is accomplished is by stressing the liveness of the event, and the physical endurance required of both speakers and audience. This was best glimpsed in the first of the events, the audacious 24-hour Marathon that Obrist organised with Rem Koolhaas in 2006, in which the two stayed up for a full day and night and conducted 20-minute interviews with 65 cultural figures. 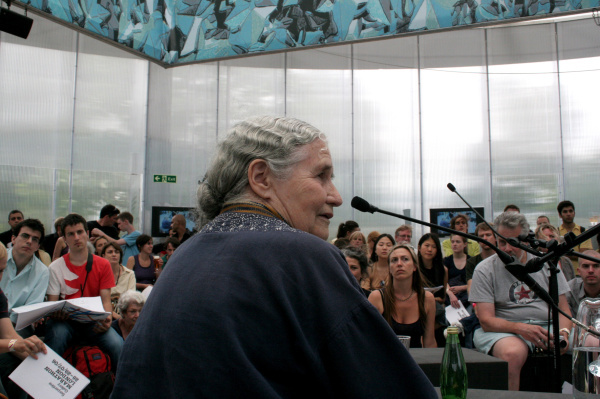 One may ask, as many have, what one could gain from posing questions to then 87-year-old Doris Lessing at, say, three in the morning, and what the audience could possibly take in at that time of the day. Equally suspect was how Obrist and Koolhaas could retain the sharpness of mind needed to productively interview figures such as Lessing or Chantal Mouffe or Eric Hobsbawm after having been awake for the best part of 24 hours. The possible wasting of both funds and opportunity were hard to ignore, but also partially the point – the 24-hour Marathon seemed to push productivity to an absurd edge, on the assumption that something new could come of such extreme circumstances. The Marathons since – two-and-a-half-day events which last from 12am to 11pm on the week-end and from 6pm to 11pm on Friday evening – have taken on board this idea of collective endurance, albeit in a softened and more palatable form, as a mode of productivity. The slightly disorganised feel of the Marathons contributes to the particular mode of sociality and collective attention, or distraction, put forth in the events: part of their uniqueness is their galloping, headlong pace, which requires that the audience will miss something – one will need a cup of coffee; to go to the bathroom; to have a sandwich. In this way it cannily mirrors the saturation of the cultural field – an over-abundance the Marathons perform while also letting the audience off the hook by the social and participative situation they engineer: simply being in the audience means participating in a cultural endeavour. Rather than asking the audience to pay attention all the time, the Marathons allow a canapé-style sampling where one can’t, even if one tried, hear everything – and The Marathons pander to, and reflect, the mode of limited and multi-tasking cultural engagement endemic to our short-term attention society. the knowledge of this permits other forms of audience behaviour that differ from the ideal of deep concentration in a cultural setting: the license to check email while listening to the talk; to flip through the paper; to tweet about the talk as it is going on. Thus it could be argued that the Marathons pander to, and reflect, the mode of limited and multi-tasking cultural engagement apparently endemic to our short-term attention society. This is partially general to the marathon format, which over the past ten years has increasingly proliferated in the creative field. Developed in Japan among graphic designers, for instance, is the Pecha Kucha model, where speakers show twenty images each for twenty seconds;1 at the Stedelijk Museum, Amsterdam, Pecha Kucha was the recent inspiration for a series of six-minute talks (organised as part of a longer public programme anticipating the Stedelijk’s re-opening this autumn),2 while the cultural marathon ‘Truth Is Concrete’ took place in Graz, Austria in September for twenty-four hours a day over eight days and centred on the question of art’s place and potential in politics.3 Significantly, these cultural marathons have emerged at the same time as the so-called ‘educational’ or ‘discursive’ turn in artistic and curatorial practice, where participation is privileged over contemplation. Within this move towards talks and discussions, moreover, these models push discursivity to a spectacular – marathon! 24 hour! – degree, turning what would be a series of talks into a must-see event. In this way they also have much to do with event culture, or the idea that refocusing something as a live event brings a greater urgency (and buzz) than a The Marathons become not just symptomatic of event culture, but also its epitome: a testing ground of just how far one can push a format and, within this format, overproduction. publication or a screening would have, and that social interaction among the audience is as crucial as the planned cultural offering. While the Serpentine is not particularly critical of event culture – via their ‘Park Nights’ programme, they’ve dedicated a strong curatorial strand to events – their Marathons seem to stand apart from general live programming, if only in their somewhat quixotic belief in the power of the event itself. That is, rather than simply trying to dress up a talk as a social bash, the Marathon pushes its eventhood – its liveness, physical format, promise of networking, ideal of audience participation – to the foreground, even at the known risk of privileging form over content. The Marathons become not just symptomatic of event culture, but also its epitome: a testing ground of just how far one can push a format and, within this format, overproduction. They are not only about what is said but about their talk-form (in the way that one now speaks about an exhibition’s ‘exhibition-form’), and as such reflect the importance of contemporary curation beyond the gallery space – and not just in the fashionable sense of ‘curating’ one’s photo album or bedside table, but of a genuine need for selecting, assembling, framing or editing in a context where the vast availability of images, texts, films and videos paradoxically hinders their visibility. In this way they find themselves in a contradictory position to their own adoption of overproduction: on the one hand they mitigate the surfeit of the digital cultural sphere by giving their audience a reason to focus on one particular subject – by making that topic the subject of a two-and-a-half-day event – and by making the sheer act of selection a form in itself. On the other hand, within this form they seek to demonstrate the vast and overwhelming expanse of ideas and artworks out there. This might be why the Serpentine Marathons and other marathon formats seem at once characteristic of many trends in contemporary culture (such as overproduction, event culture and the generalising of the practice of curating) and oddly transverse to them. Privileging the event itself, they often stop short of producing something tangible from it, beyond a retrospective catalogue -- that is, they stop short of taking part in the continuing economy of cultural production. The need for synthesis of the information often feels unmet. This question of their output, of course, is key not only to the Marathons but to the discursive turn of which they are apparently a part. Where is all this talking taking us?